The ability to read is the foundation from which we grow as human beings. We are proud to play a part in encouraging literacy for young people. Whether through the thousands of titles we produce each year or through our sponsorship of various reading programs, our employee-owners walk the talk regarding literacy. Friesens is proud to sponsor the Canadian Children’s Book Centre (CCBC). Since 2000, in cooperation with ministries of education, school boards and library organizations across Canada, the Canadian Children’s Book Centre has coordinated the production and distribution of a great Canadian picture book to be given to every Grade One child in Canada. Over 550,000 books in English and French are distributed each year. We support numerous book publishing associations that assist publishers or all sizes to bring more ideas, stories, and adventures to life through the printed page. 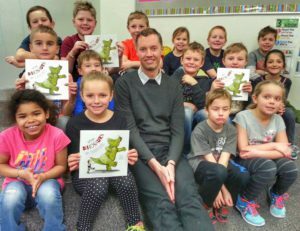 At the local level, Friesens is a sponsor of I Love to Read Month each February. Friesens employee-owners fan out across our local region to read to elementary school classes and provide a complimentary book for each student we read to.